Give your business a brand-boosting lift with some of these fantastic Company Branded Flash Drives and you can't go far wrong. Perfect for handing out to clients and customers along with your invoice, it's an everyday use tool that has fantastic practicality. Since it superseded the old floppy, CD-R's and zip disks as conventional methods of storing data, the USB Flash Drive has stood apart from the rest due to it's huge file size (which is growing by the year), it's small and versatile size and it's reliability. Let's put it this way, these days you can fit approximately 18,000 floppy diskettes onto a single USB Memory Drive! Choose your size firstly, if your customers are serious data users and you happen to be aiming at the IT market, grab some 8 or 16 gigabyte flash drives for that extra storage. For standard customers some 2,4 or 8 gigabyte flash drives will be just fine. 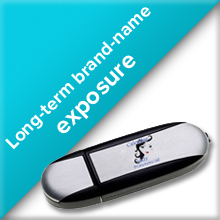 Branded with your Company's logo and brand-name, it'll be hard to miss and retain your branding. Stand out from the crowd with a batch of Company Branded Flash Drives. Click here to order your batch today, or alternatively click on "Get Prices Now" button below and we can start the process today. 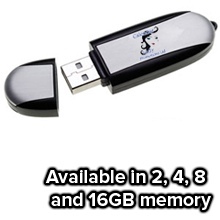 Our rating for these fantastic flashtastic memory drives is clear here - they are used every single day!